Earlier today the Japan Sport Council (JSC) released documents about the two finalists for new National Olympic Stadium in Tokyo. We know that both bids were submitted by Japanese consortia and both concepts were created by renowned Japanese architects. What we don’t know is which consortium submitted which bid, because that wasn’t revealed by JSC. We’ll have to wait until late December to find out, because that’s when JSC is expected to select the winner. Both concepts became finalists in repeated design and build competition for new National Olympic Stadium in Tokyo in November. Compared to 2012 guidelines, this time the venue had to be scaled back both in terms of function (no retractable roof and adjustable stands), capacity (70,000 instead of 80,000) and size (limited height and volume for smaller impact on surroundings). Also, the structure had to be simplified enough to allow fast construction, in well under 3 years. This of course due to extreme delays and inflation of the price along initial selection. The option nicknamed simply “A” envisages construction of three-tiered grandstands covered by a simple and uniform roof structure, peaking at 50m in height. 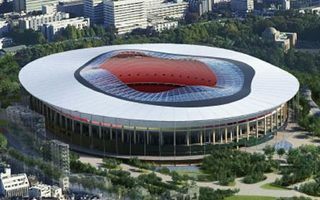 Named the “B” variant, this version of the stadium would have double-tiered stands with the lower ring partly sunken and upper one being far larger.